Natural News, the faux science website, promoted one of the most pseudoscientific lunatics on the planet, Mike Adams, pushes the frightening news that Gates Foundation partner forces vaccines on Malawian children at gunpoint, arrests parents. And then there’s a blog, that insists that vaccines cause autism (no it doesn’t), has this outrageous headline: 131 African Children Vaccinated at Gunpoint – Do Bill Gates and Paul Offit Approve? So, is this true? Well, every article about these vaccinations done at gunpoint referred to this article. It’s been pulled, for unknown reasons, probably because it was found to be inaccurate. It has not been replaced by any other article. And there’s no other article out there (other than the usual vaccine denialist websites repeating the same nonsensical myth) that substantiates this story. It was probably some police protecting the healthcare workers, but absent any other reliable evidence (and repeating the same myth is not evidence), it is nothing. Another antivaccination group is pushing the story that Gates is at fault for 47,500 paralysis cases after polio vaccine in India. However, the CDC has reported that there have been no cases of polio in India since 2011, compared to the 741 case in 2009. The paralysis cases were identified as non polio Acute Flaccid Paralysis, which can result from any number of non-polio viruses or bacterium. In this case, non-polio enteroviruses were identified as the cause, and not polio that resulted from the vaccines themselves. In fact, as I discussed before, polio vaccines may spontaneously recombine in the wild, and can be transmitted to other humans. However, in India with a population of 1.2 billion people, there have only been a few cases of actual polio from recombination events. If it were widespread, we’d see millions of cases, but we don’t. Debunked. Uganda’s Children are Dying! Are Pharmaceutical Trials to Blame? It’s a mysterious disease, called Nodding Disease, which the anti-vaxxers immediately blame on vaccine trials (sponsored by Gates of course). Because those same anti-vaxxers have access to massive scientific laboratories staffed with huge numbers of scientists and medical professionals they were able to uncover this cause immediately. Well, actually they don’t. Real scientists are unsure of the cause, but they are running real clinical trials, providing real medical care, and are attempting to uncover the real cause. That’s science. Bill Gates says vaccines can help reduce world population. And it’s Natural News at it again with Quote Mining. What Gates actually said was that the birth rate drops naturally because survival rate of children INCREASES from vaccines! Saving children is precisely what vaccines are supposed to do. I don’t think that Bill Gates is perfect. For example, I’ve always hated Windows for many reasons, but I’m in the minority on that point. But this blog is not about Apples vs. Windows, it’s about skepticism towards pseudoscience. Bill Gates has decided to take that money that he has earned from ruling the computer world to do some good for the planet, saving lives. 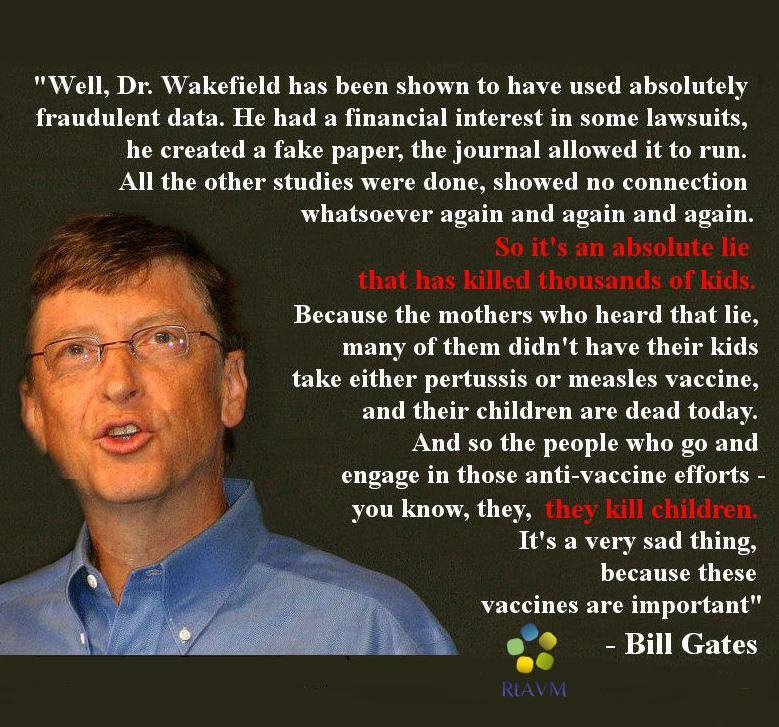 The vaccine deniers are just inventing lies because Bill and Melinda Gates have made it their cause to help the people of this world live better, live longer, and live healthier with vaccines and better health care. Not that Gates is listening to me, but keep doing it, because Vaccines Save Lives. Editor’s note: This article was originally published in August 2012. It has been completely revised and updated to include more comprehensive information, to improve readability and to add current research. Dhole TN, Ayyagari A, Chowdhary R, Shakya AK, Shrivastav N, Datta T, Prakash V. Non-polio enteroviruses in acute flaccid paralysis children of India: vital assessment before polio eradication. J Paediatr Child Health. 2009 Jul-Aug;45(7-8):409-13. doi: 10.1111/j.1440-1754.2009.01529.x. Epub 2009 Jul 20. PubMed PMID: 19712176. Impact factor=1.254. Wadman M. African outbreak stumps experts. Nature. 2011 Jul 13;475(7355):148-9. doi: 10.1038/475148a. PubMed PMID: 21753824. Impact factor=38.597.